Sunday, blogger buddy Chris and I drove out to Tlacolula for market day. 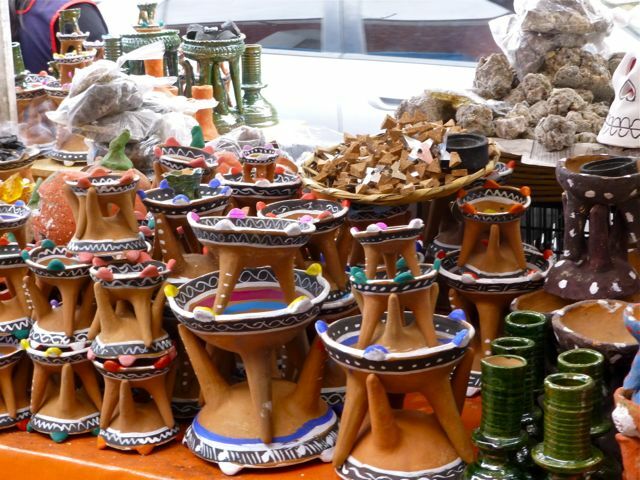 It didn’t take long to realize this wasn’t your usual Sunday market — there seemed to be twice the number vendors and twice as many shoppers. 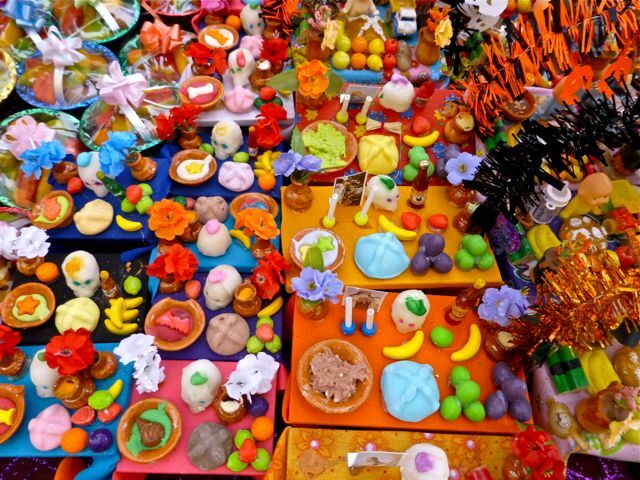 It was the Sunday before the Días de los Muertos and this mega mercado was providing those who live in the surrounding area with everything they could possible need for their ofrendas (Day of the Dead altars). Mounds of apples, tangerines, and other fruit. 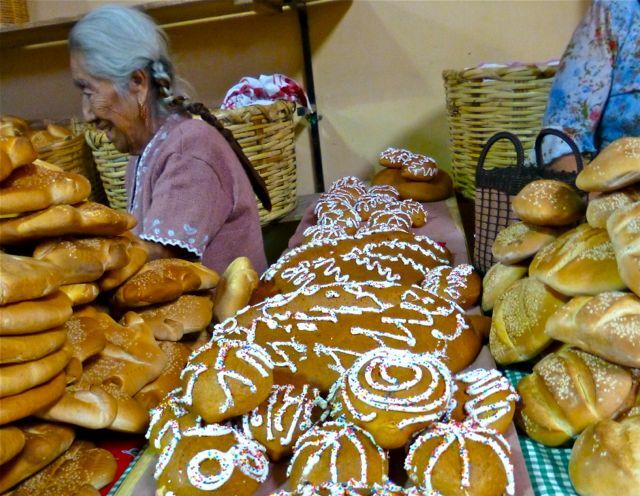 Rows upon rows of pan de muerto (the special Day of the Dead bread). 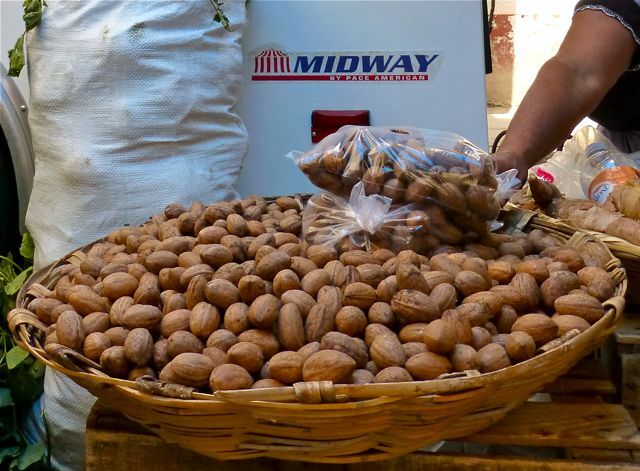 Wheelbarrows full of peanuts and pecans. 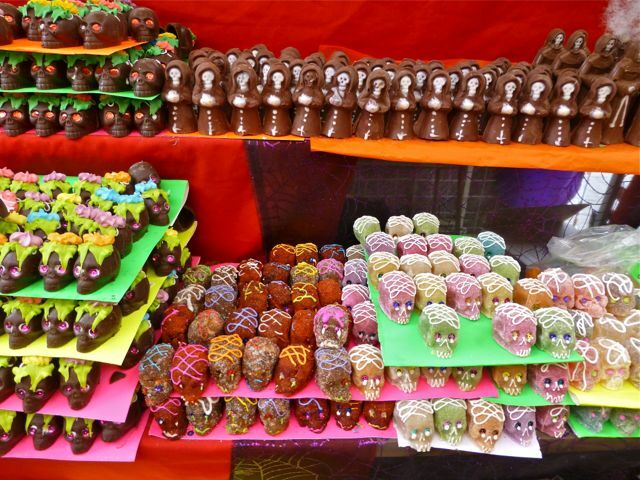 And, in the city of Oaxaca, special Muertos vendor stalls have been set up between the Benito Juárez Mercado and 5 de Mayo Mercado for city dwellers to stock up. 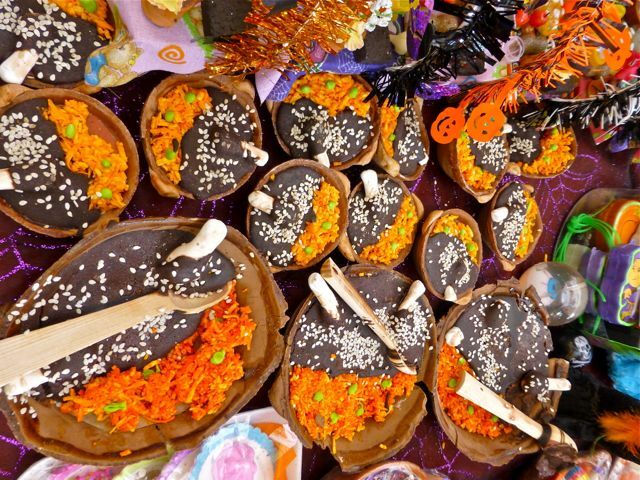 Intricately decorated sugar and chocolate skulls (calaveras) to satisfy the sweet tooth of Mictlantecuhtli (Goddess of Death). 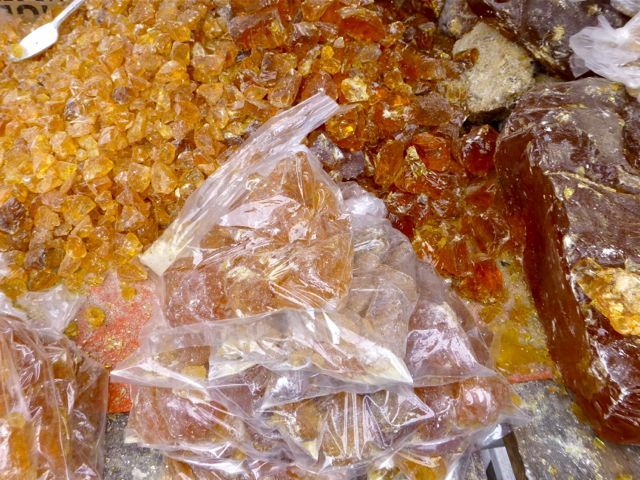 waited to burn copal resin and perfume the air with its wonderful, and now familiar, scent. and included these diminutive plates of mole and arroz (rice) — which I couldn’t resist buying for my altar! 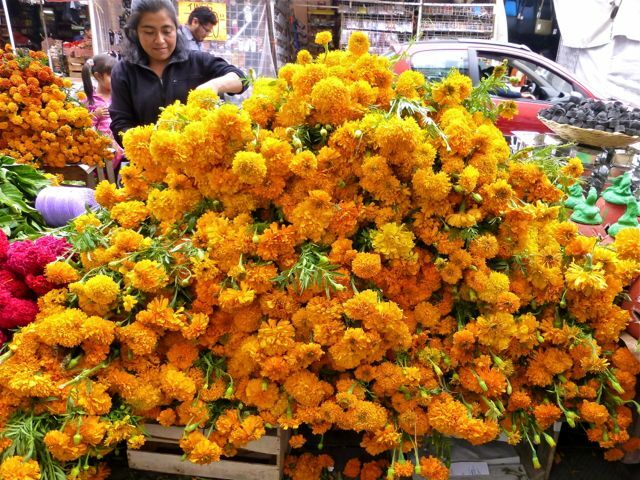 And, of course, there were mounds and mounds of Cempazuchitl (marigolds), the flower of the dead, that grows wild in Oaxaca at this time of year. All the necessary purchases have been made, now to build my ofrenda. 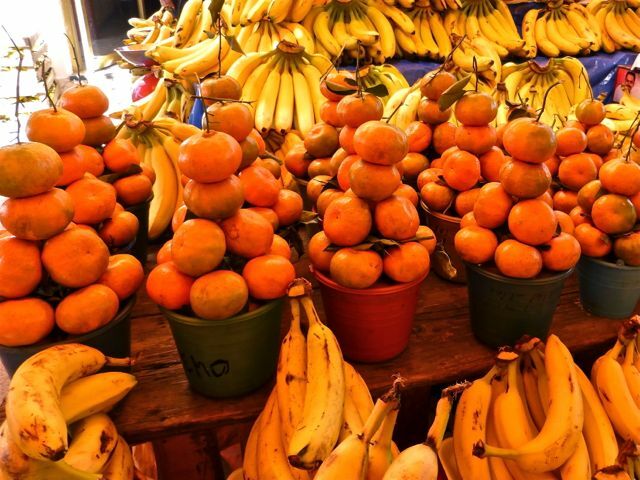 Your lovely posts remind me of a trip to Oaxaca that my husband and I made. We took an eco-tour through the mountains. So beautiful. We yearn to go back sometime. In the meantime, I am pleased to pass on the Reader Appreciation Award to you. Here are the details – http://agujasblog.com/2012/11/01/giving-thanks/. Disfruta y felicidades. ¡Verónica, muchisimas gracias! I’m in recovery from all the Días de los Muertos activities. Each year I’ve been here, I think it can’t possibly get better, but it does. Hope you and your husband can one day return to this magical and inspiring place.